You are now called on to shew to the world that you are competent to take your place among nations, that you have a right to claim their recognizance of you, as an independent country, by the only satisfactory proof you can furnish of your capability of maintaining your independence, your wresting it from England with your own hands. In the development of this system, which has been organized within the last eight months, at the close of internal defeat and without the hope of foreign assistance; which has been conducted with a tranquility, mistaken for obedience; which neither the failure of a similar attempt in England has retarded, nor the renewal of hostilities has accelerated; in the development of this system you will show to the people of England, that there is a spirit of perseverance in this country, beyond their power to calculate or to repress; you will show to them that as long as they think to hold unjust dominion over Ireland, under no change of circumstances can they count on its obedience; under no aspect of affairs can they judge of its intentions; you will show to them that the question which it now behoves them to take into serious and instant consideration, is not, whether they will resist a separation, which it is our fixed determination to effect, but whether or not, they will drive us beyond separation; whether they will by a sanguinary resistance create a deadly national antipathy between the two countries, or whether they will take the only means still left, of driving such a sentiment from our minds, a prompt, manly, and sagacious acquiescence, in our just and unalterable determination. In calling on our countrymen to come forward, we feel ourselves bound, at the same time, to justify our claim to their confidence by a precise declaration of our views. 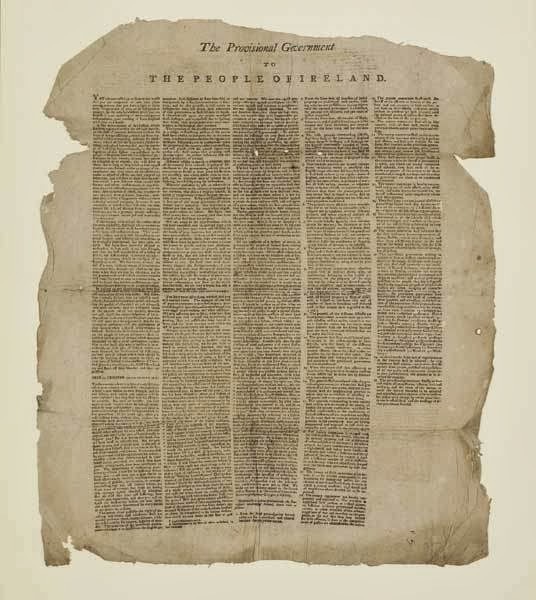 We therefore solemnly declare, that our object is to establish a free and independent republic in Ireland: that the pursuit of this object we will relinquish only with our lives: that we will never, unless at the express call of our country, abandon our post, until the acknowledgment of its independence is obtained from England; and that we will enter into no negotiation (but for exchange of prisoners) with the government of that country while a British army remains in Ireland. Such is the declaration which we call on the people of Ireland to support – And we call first on that part of Ireland which was once paralysed by the want of intelligence, to shew that to that cause only was its inaction to be attributed; on that part of Ireland which was once foremost, by its fortitude in suffering; on that part of Ireland which once offered to take the salvation of the country on itself; on that part of Ireland where the flame of liberty first glowed; we call upon the NORTH to stand up and shake off their Slumber and their oppression. We are aware of the apprehensions which you have expressed, that in quitting your own counties, you leave your wives and children, in the hands of your enemies; but on this head have no uneasiness. If there are still men base enough to persecute those, who are unable to resist, shew them by your victories that we have the power to punish, and by your obedience, that we have the power to protect, and we pledge ourselves to you, that these men shall be made to feel, that the safety of every thing they hold dear, depends on the conduct they observe to you. Go forth then with confidence, conquer the foreign enemies of your country, and leave to us the care of preserving its internal tranquillity; recollect that not only the victory, but also the honour of your country, is placed in your hands; give up your private resentments, and shew to the world, that the Irish, are not only a brave, but also a generous and forgiving people. You have your instructions, we trust that you will execute them. The example of the rest of your countrymen is now before you; your own strength is unbroken;-five months ago you were eager to act without any other assistance. We now call upon you to shew, what you then declared you only wanted the opportunity of proving, that you possess the same love of liberty and the same courage with which the rest of your countrymen are animated. We had hoped for the sake of our enemies to have taken them by surprize, and to have committed the cause of our country before they could have time to commit themselves against it, but though we have not altogether been able to succeed, we are yet rejoiced to find that they have not come forward with promptitude on the side of those who have deceived them, and we now call on them before it is yet too late, not to commit themselves further against a people they are unable to resist, and in support of a government, which, by their own declaration has forfeited its claim to their allegiance. Of the inefficacy of a system of terror, in preventing the people of Ireland from coming forward to assert their freedom, you have already had experience. Of the effect which such a system will have on our minds in case of success, we have already forewarned you – We now address to you another consideration – If in the question which is now to receive a solemn and we trust final decision, if we have been deceived reflection would point out that conduct should be resorted to, which was the best calculated to produce conviction on our minds. What would that conduct be? It would be to shew to us that the difference of strength between the two countries [is such], as to render it unnecessary for you to bring out all your force; to shew to us that you have something in reserve wherewith to crush hereafter, not only a greater exertion on the part of the people, but a greater exertion, rendered still greater by foreign assistance: It would be to shew to us that what we have vainly supported to be a prosperity growing beyond your grasp, is only a partial exuberance requiring but the pressure of your hand to reduce it into form. But for your own sake do not resort to a system, which while it increased the acrimony of our minds would leave us under the melancholy delusion that we had been forced to yield, not to the sound and temperate exertions of superior strength, but to the frantick struggles of weakness, concealing itself under desperation. Consider also that the distinction of rebel and enemy is of a very fluctuating nature; that during the course of your own experience you have already been obliged to lay it aside; that should you be forced to abandon it towards Ireland you cannot hope to do so as tranquilly as you have done towards America, for in the exasperated state to which you have raised the minds of the Irish people; a people whom you profess to have left in a state of barbarism and ignorance, with what confidence can you say to that people ” while the advantage of cruelty lay upon our side, we slaughtered you without mercy, but the measure of our own blood is beginning to preponderate, it is no longer our interest that this bloody system should continue, shew us then, that forbearance which we never taught you by precept or example, lay aside your resentments, give quarter to us, and let us mutually forget, that we never gave quarter to you.” Cease then we entreat you uselessly to violate humanity by resorting to a system inefficacious as an instrument of terror, inefficacious as a mode of defence, inefficacious as a mode of conviction, ruinous to the future relations of the two countries in case of our success, and destructive of those instruments of defence which you will then find it doubly necessary to have preserved unimpaired. But if your determination be otherwise, hear ours. We will not imitate you in cruelty; we will put no man to death in cold blood, the prisoners which firstfall into our hands shall be treated with the respect due to the unfortunate; but if the life of a single Irish solder is taken after the battle is over, the orders thence forth to be issued to the Irish army are neither to give or take quarter. Countrymen if a cruel necessity forces us to retaliate, we will bury our resentments in the field of battle, if we are to fall, we will fall where we fight for our country – Fully impressed with this determination, of the necessity of adhering to which past experience has but too fatally convinced us; fully impressed with the justice of our cause which we now put to issue. We make our last and solemn appeal to the sword and to Heaven; and as the cause of Ireland deserves to prosper, may God give it Victory. 4. The Irish generals commanding districts shall seize such of the partizans of England as may serve for hostages, and shall apprize the English commander opposed to them, that a strict retaliation shall take place if any outrages contrary to the laws of war shall be committed by the troops under his command, or by the partizans of England in the district which he occupies. 9. The generals are to apprize their respective armies, that all military stores, arms, or ammunition, belonging to the English government, be the property of the captors and the value is to divided equally without respect of rank between them, except that the widows, orphans, parents, or other heirs of such as gloriously fall in the attack, shall be entitled to a double share. 30. The provisional government strictly exhort and enjoin all magistrates, officers, civil and military, and the whole of the nation, to cause the laws of Morality to be enforced and respected, and to execute as far as in them lies justice with mercy, by whcih [sic] alone liberty can be established, and the blessings of divine providence secured. Robert Emmet read part of this proclamation in Thomas Street, Dublin, in July 1803. It was the last official communication of the Society of United Irishmen. Emmet was executed on 20th September 1803. You can read more on republican proclamations here. The photograph below was posted online by Gerry Adams. 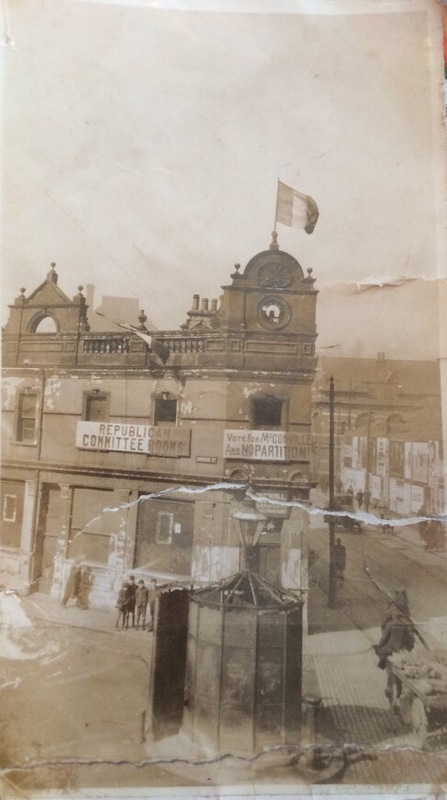 It is of the republican election headquarters in the former Oceanic Bar, at the corner of Barrack Street and Divis Street at the time of the April 1925 elections. The photograph neatly tidies up an existing account of that election that was otherwise unclear. In West Belfast Sinn Féin had rented the old Oceanic Bar at the corner of Barrack Street which was lying empty. There was also an old Pawn Shop and a Sales Room, side by side in Divis Street beside the Oceanic Bar. These were rented as Committee and Tally Rooms. Speakers from Dublin began pouring in to help the campaign for McConville. Constance Markievicz, Dr Ida English, Frank Brady and his sister were there; as well as Sean McBride, Donagh O’Donoghue, Sheila Humphries, Tom Daly, Andy Coone and Pat McCormack from the Glens. The lads who had been newly recruited into the IRA worked like trojans alongside the girls and women of Cumann na mBan. Prominently identified were Cassie O’Hara, Bridie O’Farrell, Mary Donnelly, Mrs Ward, Bank Street, Maggie Kelly nee Magennis, May J. O’Neill nee Dempsey, Sally Ward nee McGurk, Kitty Kellet, Sally Griffen, Susan Rafferty, Mary Rafferty, May Laverty, Louis McGrath and sister Margaret, Miss McKeever, Mrs. Muldoon, Mrs. McLoughlin and Kitty Hennessy. These were the girls who carried the banner of Republicanism back to the Falls and little thanks they got for it from some of the locals there. There were also the families who kept open doors for us in the Lower Falls; The Cunninghams of Slate Street, Charley and Brigid Rafferty in Scotch Street, Koitty Hennessy and her mother. Mrs McLoughlin of Galway Street. These were the people we were proud of. If it hadn’t been for their untiring work in spreading a new Gospel of Republicanism in the Falls might never have risen to the challenge it faced in later years. That election in 1923 was a political disaster for Sinn Féin and for us as republicans. McConville was defeated in West Belfast and Hugh Corvin got a miserly 1200 vote in North Belfast, in spite of the fact that he and McConville were still interned on the Argenta prison ship. But the Bone and Ardoyne voted solidly. The photograph showing the McConville headquarters in the old Oceanic Bar now clears this up. McNally appears to be referring to two different elections here (although neither was in 1923 as there weren’t republican candidates put forward in Belfast in any of the elections that year). Hugh Corvin stood in North Belfast in an election in October 1924 (for Westminster) while Pat Nash stood in West Belfast. Sean McConville then stood in an election to the northern parliament held in April 1925. Corvin didn’t run in that election (there was no republican candidate in North Belfast). Whether it was in use as an election headquarters in October 1924, the photograph shows that the former Oceanic Bar was clearly in use during the April 1925 election. The building had been in use as an engineering works for a short while after the bar had closed. The photograph itself appears to have been taken from an upper storey if St Mary’s Christian Brothers School on the other side of Barrack Street. Sean McConville had been Commandant of the Lurgan Battalion then vice O/C of the 3rd Brigade of the IRA’s 4th Northern Division, under Frank Aiken. He was nominated in March for West Belfast in the election to the northern parliament that was to be held in April. The other candidates in West Belfast (which was to elect four MPs using proportional representation) were unionists Thomas Henry Burn, Robert John Lynn, Robert Dickson, nationalist Joe Devlin, independent unionist Philip James Woods, Labour’s William McMullen and McConville. Torchlight processions alongside a band in support of McConville (as described by McNally) were recorded in the nights before the election although the press claimed there was ‘not the slightest untoward incident’. 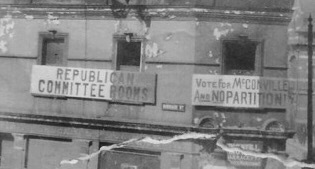 However, the photograph of the election headquarters appear to show the boarded up windows on the ground floor which are consistent with McNally’s account of the election. The press reports at the time indicate that there were processions by the Devlinites every night in the lead up to the election. Of the many luminaries listed as speakers during the campaign, Andy ‘Coone’ is Andy Cooney (IRA Chief of Staff by 1926) while Belfast republican Cassie O’Hara had been the fiance of executed IRA leader Joe McKelvey (thanks to Tim McGarry for this information). At the end of the first count, the quota was declared as 9,897. Devlin had received 17,558 votes and was elected. He was followed by Woods (9,599), Lynn (8,371), Burn (4,805), McConville (3,146), Dickson (3,133) and McMullen (2,269). Devlin’s surplus was then distributed giving Woods 11,071 (+1,472), Lynn 8,507 (+137), McMullan 7,237 (+4,968), Burn 4,878 (+73), McConville 4,456 (+1,310) and Dickson 3,438 (+305). With Woods elected, but his surplus failed to elect anyone so Dickson was elimited, with his transfers then electing Lynn on 10,437 votes with McMullan now on 8,002, Burn on 5,980 and McConville on 4.545. Since Lynn had an insufficient surplus to elect anyone, McConville was eliminated and his transfers elected McMullen who ended on 10,345 (+2,343) to Burn’s 6,515 (+532). The IRA’s flirtations with politics were to be intermittent and violent electoral clashes with the nationalists were to continue into at least the late 1930s. On 6th September 1940, De Valera’s government had Patrick McGrath and Thomas Harte executed in Mountjoy Prison. The other prisoners heard McGrath and Harte being brought from their cells and marched away, then the volley of shots being fired. A commemoration was held inside the prison that morning by the remaining republican prisoners at which the oration was given by George Plunkett, the brother of executed 1916 leader, Joseph Plunkett. McGrath himself was a veteran of the fighting in Dublin in 1916. The sentences of death imposed on Patrick McGrath and Thomas Harte for the murder of Det-Off. Hyland on August 16 were carried out yesterday morning at Mountjoy Prison. The Stephen Hayes confession contains a claim that in the interval between McGrath and Harte’s arrest and their execution, De Valera’s government had threatened to execute McGrath and Harte unless: “(1) The Army in the South would hold no armed parades. (2) That arms in the South be dumped. (3) That no aggressive action be taken against the Free State Military or Police Forces. (4) That no supplies of arms and ammunition be sent to the Units in the Six Counties.” While verification of anything in the Hayes confession is problematic, the alleged go-betweens like Sean Dowling, were criticised in War News at the time. In September 1940, the only IRA volunteers executed since the 1920s had been Peter Barnes and James McCormick, by the British government, in February 1940. The sentence of death was carried out yesterday morning on Maurice O’Neill (25), a native of Cahirciveen, Kerry, who was found guilty on November 5, by a Military Court, of having fired at three detective officers at Donnycarney, Dublin, on the night of October 24, with intent to prevent his own arrest and that of another person not in custody. With no little irony (on 5th November), The Irish Press had reported that O’Neill had been sentenced to death alongside an article on the 1916 memorial which was in the National Museum at the time. Am not sure if this is still available to buy, but can currently be watched on Youtube. It’s worth the time to sit down and watch as it is a great piece of film because so little has been recorded about the generations of republican activists in Belfast before the 1960s. This is the text of The Irish Press coverage of the lead up to Tom Williams’ hanging on 2nd September 1942. Two years previously, on 6th September 1940, De Valera’s government had executed Thomas Harte from Lurgan and Patrick McGrath, a 1916 veteran. The difference in the coverage, publicity and reprieve campaigns are significant. The same could also be said for the coverage of the execution (again by the Fianna Fáil government) of George Plant on 5th March 1942. I’ll reproduce the coverage from 1940 next week on the anniversary. You can read some more on the backdrop to Williams’ execution here. (IRISH PRESS Special Reporter), BELFAST, Tuesday [1st September]. 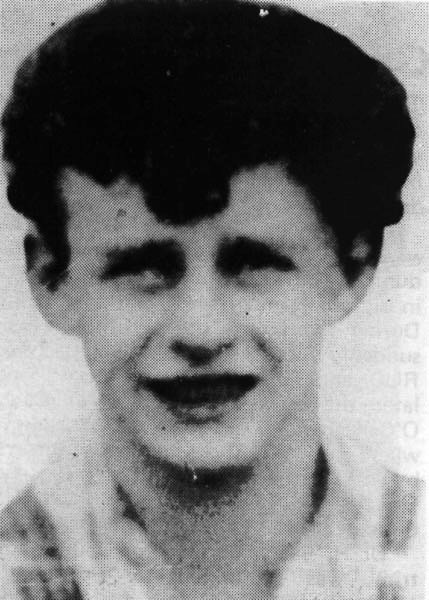 The petition for the reprieve of Thomas J. Williams, to be executed in Belfast Prison tomorrow, has been refused. A statement issued to-night said that the Six-County Governor, having considered the further petition submitted in the case had decided “that the law must take its course“. An armed guard was placed outside the jail, where.a notice of the decision of the Government had been nailed-up after the black-out. The Belfast Reprieve. Committee, at a final meeting, urged the people to maintain the same restraint they had shown through the campaign. They also requested all to attend Masses in the city churches in the morning and to show some manifestation of mourning by drawing blinds in their homes. They sent the following final telegram at 8.30 to the British Prime Minister: “Belfast Reprieve Committee make this final appeal to you at this eleventh hour for mercy to Thomas J. Williams“. The news that a .reprieve had been refused was broken to the condemned youth at 9.45 to-night by Mr. D. Marrinan, his solicitor, in the presence of his grandmother, Mrs. M. Fay, with whom he lived at 47 Bombay Street; his uncle, Mr. C. Fay, and his brother, Richard, who is a member of the Irish Air Corps. Just before Mr.. Marrinan arrived Williams received the following telegram from his father who is a Sergeant-Major in the Irish Army: “Tom, be brave to the end, son. Goodbye and God bless you.” To Mr. Marrinan the youth gave the following message: “Thank all for their efforts to save me. I am quite resigned if it is God’s holy Will and if it is done for Ireland“. It was at Mr. Marrinan’s request that the relatives of the youth were present when the news was broken to him. He took the announcement unflinchingly. Mr. Marrinan said that three priests would remain with Williams until 11 o’clock – Rev. V. McAllister, Prison Chaplain; Rev. Rr. Alexis, C.P. ;and Rev. K. McEneany, and that he would attend Mass and receive communion at 7.30 a.m. The relatives left the prison at 10 p.m. One of the last to see Williams was Mr. G. McGouran, printer, Bank St., Belfast, his former employer. When the official news from the Government was given to Mr. Marrinan to-night by the Assistant Secretary to the Six-Co. Ministry for Home Affairs, Mr. Marrinan expressed dissatisfaction and drew his attention to Judge Murphy’s charge to the jury, in which he stated that three bullets’ had been fired from William’s gun and two from another; that it was the bullet from another gun that caused instant death. Mr. Marrinan had earlier gone to Stormont hoping to interview the Prime Minister, Mr. Andrews. He was accompanied by Mr. C. E. Reddin, Dublin Secretary Licensed Grocers and Vintners Association. Unable to see Mr. Andrews, Mr. Marrinan saw the Secretary to the Cabinet, Mr. Robert Gransden, before the Cabinet meeting began. Mr. Marrinan said that Williams, out of loyalty to his comrades, accepted the guilt in his alleged voluntary statement and that position was not accepted at the trial. Why did tho Cabinet reverse that procedure and use Williams’ statement to decide his fate? Medical evidence disclosed that there were five wounds in the constable’s body, and the evidence showed that the bullet which passed through the heart causing instant death, was not caused by Williams. Prayers were said by groups of people in streets in the Falls Road area to-night. The Rosary was said outside the house in Bombay Street where Williams lived with his grandmother, Mrs. Fay. The Reprieve Committee in Dublin stated last night that in the event of Williams’ execution every business was expected to close down to-day between 11 and 12 noon. The public are expected to attend places of worship and offer prayers for the repose of the.soul of Williams. Last evening Mr .Shane Leslie, who is staying in Dublin, had an interview with Messrs. Sean MacBride, L. J. Duffy and Roger McHugh, representing the Reprieve Committee. It was later announced that Mr. Leslie forwarded to the Duke of Abercorn the following telegram: “Recalling days of chivalrous rivalry at Derry and acknowledging your dignity and humanity under the present difficulties, I venture to believe that you can secure a common sympathy amongst all Irishmen. In days when Irishmen on both sides of the Boyne are meeting a common enemy. I believe a single stroke of your pen could secure peace and good feeling in Ireland for the rest of our time“. Mr. Leslie, as a Nationalist candidate, contested Derry City against the Duke, then representing the unionist interest, at the first general election in 1910. Mr. C. B, Reddin, Secretary of the Licensed Grocers’ and Vintners’ Association, announced in Belfast last night it was the request of his Association that all licensed premises in the Twenty-Six Counties should close their premises’to-day (Wednesday) from 11 to 12 noon. Before going to Stormont, Mr Reddin had a conference with Senator T. Lynch, Councillor J. Kilpatrick, Capt. Denis Ireland, President of the Ulster Union Club, and Mr. Eamonn Donnelly.